It may be revealing that the rather large audience at the screening I attended of Sky Captain and the World of Tomorrow (Kerry Conran, 2004) was stone-silent during a moment that seems obviously to have been designed to make spectators burst out in applause. 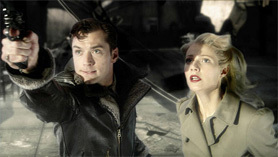 In this moment, intrepid hero Joe Sullivan (Jude Law) is about to get killed by an acrobatic Asian woman assassin when his love interest Polly Perkins (Gwyneth Paltrow) – whom he thought he had left behind (since girls obviously aren’t made for action and adventure) – shows up and saves him by violently disposing of his would-be killer. The scene seems to be one of those rousing moments of redemption – here, the woman shows her mettle even though Joe hadn’t had any belief in her derring-do – that are so important in recent big-budget action-adventure films. Among the many movies that Sky Captain tropes off of, the Indiana Jones films are a clear source of inspiration, not only in the kinds of stories they tell but in the virtually Pavlovian relationship they set out to foster with spectators who are given emphatic cues when to cheer, laugh, applaud, find delight and so on. At the very least, that the scene of feminine fortitude in Sky Captain fell flat may have something to do with story-telling inadequacy. Sky Captain may appear to want to tell a gripping tale of adventurous escapism but it doesn’t really seem to have much interest in its own narrative logic. It’s not clear that the filmmakers really care if we care. At a moment in Hollywood history when studio executives are coming more explicitly but also more cynically to declare that they themselves don’t believe much in the entertainment value of the cultural products they fabricate – Viacom’s former head, Mel Karmazin, in charge of production at Paramount, once notoriously said he didn’t read the scripts for movies he greenlit since moviemaking was little more than arts and crafts – Sky Captain itself takes form as cynical product with little belief in the worth of story-telling. Thus, for instance, the film has a MacGuffin that everyone is after – metallic-like vials with the secret of existence in them or something like that – but half-way through the film the bad guys manage to steal it and it’s never referred to again. Likewise, when Sky Captain’s sidekick Dex (Giovanni Ribisi) is captured by the bad guys but the plot needs him to have escaped, it simply has him show up announcing he’s escaped: no need to explain, no need to show. The film exhibits an insouciance toward plot construction that is all too typical of ersatz storytelling in the newest New Hollywood. Instead of taking the effort to perfect its story, Sky Captain just throws little bits of action at the spectator, hoping that some of them will hit home. And instead of even vaguely pretending that this is a real story we should care about, the film further deconstructs its own narrative logic by making so many of the scenes into spot-the-reference postmodern allusions to other films. (For example, the ending – Polly and Joe out at sea after blowing up the bad guy’s lair – is straight out of James Bond.) To this extent, it’s hard for an audience to care much what happens from moment to moment (such as Polly coming finally to stand up as an action heroine rather than the wimp she’s been for much of the time). With its minimally interesting storyline (or jumble of storylines as the story veers with sharp turns from urban war-of-the-worlds fantasy to trek-across-the-Himalayas adventure to Star Wars saber duels inside in rocket ship), its rush of stunning imagery, and its overpowering soundtrack, Sky Captain becomes less a narrative for one to follow closely than an operatic performance, the pop cult version of the Wagnerian Gesamtkunstwerk (total art work) that affectively floods over the spectator as a rush of overpowering sights and sounds. It’s also hard to feel excited about the redemption of a character such as Polly since character itself doesn’t seem to matter much in Sky Captain. It’s not just that Gwyneth Paltrow doesn’t really have it in her to play the clever-quipping Hawskian heroine that director Kerry Conran modelled Polly on. More than any inadequacy of the actress herself, the very conceit of the film would have it that character doesn’t much matter other than as a mere prop in a cinematic game. Much more fitting than Gwyneth who comes to the film with the pedigree of gravitas (literary films like Shakespeare in Love, Sylvia, or Possession) is Angelina Jolie in the secondary role of Franky Cook: from her background as Laura Croft, Jolie at least knows how to play in a comic-book universe. 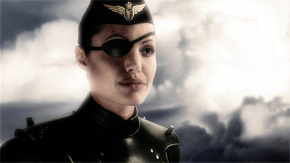 Her very looks (collagen-like lips that make her overly pouty and for this film an eye-patch) and her acting style (robotic and clipped military precision) seem to accept the film’s premise of an essential anti-humanism. Like other physical freaks such as Michael Jackson, there’s something mechanically freakish about Jolie that makes her seem appropriate to an age that is itself becoming more cartoonish. In such a context, it often seems hard to believe in old values and virtues of character. By now, the visual conception of Sky Captain is well-known: the actors (perhaps they should be called mere “players”) acted out their parts in front of blue screens for which animated backgrounds were then digitally substituted. There is no shot in Sky Captain that does not involve blue screening, none in which the characters move among physically existing environments or sets. The effect certainly looks great, especially in sequences early in the film that capture the wonder of deco modernity in the big city. One thinks, for instance, of the very opening in which a massive dirigible docks as the snow falls down at a New York skyscraper. But it is in fact intense visuality of this sort that draws all the attention in the film – it’s what we are in awe of – and character and plot suffer by comparison. As does any sense of meaningfulness: Sky Captain‘s blur of multiple historicities (Hindenburg in New York, giant robots lumbering down its city streets, future technologies from a seemingly alternate universe made anodyne, and so on) is fun to watch but it doesn’t signify anything but its mere sheer watchability. 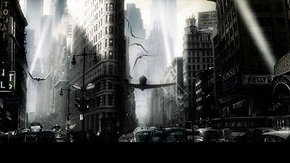 The film’s mashing together of references across time is like the imaginary “city” of the previous year’s Triplets of Belleville where globalism is enacted simply by making one city a blend of all cities; in like fashion, Sky Captain ransacks modernity to turn historical reference into mere style and good show. In 2004, Sky Captain stands as a central example of Hollywood cinema’s desire to move even further from any take on the real world (something it had abandoned to television with the latter’s newfound obsession with so-called “reality TV”). Sky Captain becomes an apt metaphor of a new “New Hollywood” that tries to trade story and character for technical prowess in the digital realm. Along with Polar Express (Robert Zemeckis, 2004), which came out in the USA a few months later, the film is a symptom of Hollywood’s ever greater immersion in imaginary realms supposedly to be marvelled at but void of all drama and reason. Not for nothing did Disney, one of the studios most committed to imaginative realms (or as they themselves put it, “imagineering”), refuse to distribute the political documentary, Fahrenheit 9/11, which its subsidiary Miramax had produced. All the more committed to its magical kingdoms, Hollywood increasingly had a hard time letting any glimpse of reality into its fortress. In its very title, Sky Captain may invoke action heroes in ways that look back to rousing tradition of heroically adventurous masculinity. But even in that title, the intrepid fighter is identified only by function (it’s not “Joe Sullivan” but “Sky Captain”), as if his identity were merged with his organisational role. It’s worth noting the extent to which this Sky Captain, and numerous other figures in this film supposedly about physical prowess, spend their time encased in vehicular technologies ranging from dirigibles to airplanes to rockets to space shuttles and so on. It is as if the human body has little force in itself and becomes little more than a mere element in a prosthetic carapace. The individual body becomes an operational component of a larger technology. Even as it lauds the adventures of “Sky Captain”, the film engages in a disavowal of classic narrative notions of flesh-and-blood character who accomplish things from the depths of psychological will. The preponderance of vehicles that take to the air fulfill at least three functions in the film: vehicles become, to paraphrase Marshall McLuhan, “extensions of man” that thereby downplay human psychology and human corporeality; they serve as metaphors for the nature of adventure narrative insofar as they often work simply to bring characters from one plot turn to the next; and their balletic moves through space serve as visual spectacles that can channel viewer attention and give it something to marvel at. If the film superficially makes some gestures toward the older mythology of heroic character, its “world of tomorrow” really is one in which character-driven story ceases to have much purchase. In this respect, it may well be that the real derring-do exploits that the film lauds are not those of its title figure than those accomplished by the vast hordes of techno-geeks that the end credits celebrate. The engineers, sfx crews, and computer whizzes are the real heroes of this film. After Sky Captain‘s ersatz fiction has come to its end, the credits roll endlessly and show just how labour-intensive was the process of bringing these images to the audience. Rather than existing as a superfluous appendage, the end credits offer the real narrative of this film: not its flimsy fictional story but the way in which hordes of techies used their wiz-bang know-how to create marvel and awe. Through its end-credits, Sky Captain becomes an allegory of its own technical and technological achievement in fabricating an engrossing but meaningless world of wonder. In reaction to Bush’s own performance of tough masculinity, John Kerry turned to emphasising time and again that he had been a Viet Nam war hero as if caught necessarily in the macho game of one-upsmanship about heroic male bodies on the line. At the same time, it seemed clear to many people that Bush was a mere puppet of offscreen handlers and string-pullers. As with Joe, behind Bush’s bravado was a legion of engineers working to craft an image of strong-willed individuality even as it became apparent that all such individuality might be antiquated in an age of image and media manipulation, of politics as theatre. But then the greatest paradox was that this revelation didn’t seem to matter. Ironically, it was the messenger – the new Hollywood cinema of simulacral films like Sky Captain and Polar Express which revealed the emptiness of images – that ordinary citizens resisted (neither Sky Captain nor Polar Express have done anywhere near the box office business the studios expected and needed), while the simulacral president himself was returned to office. Here, once again, was a disconnect of culture and politics: cinema can warn of the worthlessness of images even as they continue in the everyday political realm to weave their dangerous spell. Dana Polan is a professor of Cinema Studies in the Tisch School of the Arts at NYU. He is the author of eight books including The Sopranos, Power and Paranoia, Jane Campion and Scenes of Instructions: The Beginnings of the US Study of Film.